Kolkata Knight Riders did not have several players key to their success over the years for their opening game of the 2016 season. Shakib Al Hasan and Morne Morkel, central to their plans last season, were benched. Sunil Narine, who played a stellar role in their title-winning run in 2012 and 2014, was unavailable because of his father's death. Did it hamper them? 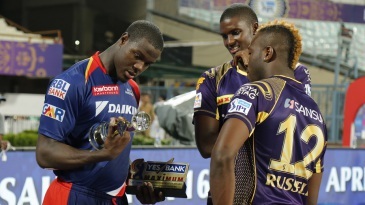 It didn't look like it, as Andre Russell and Brad Hogg took three wickets apiece to skittle Delhi Daredevils for 98. Robin Uthappa and Gautam Gambhir's 69-run opening partnership then set a strong platform for a nine-wicket win with 35 balls to spare. Russell and John Hastings, who took Morkel's place, ran in hard and hit the deck harder to extract unusually high bounce. Quinton de Kock, who had pulled Umesh Yadav for back-to-back boundaries, was the first to go when he skewed a catch to mid-off. Four balls later, Shreyas Iyer was trapped lbw for a duck. Mayank Agarwal and Karun Nair also exited in successive overs as Hastings capped the Powerplay with a wicket maiden. By then, Daredevils were in a familiar spot at 35 for 4.